Our last morning in Nova Scotia we took a drive up to Martinique Beach. Absolutely gorgeous beach – truly one of the most beautiful beaches I’ve visited anywhere. Was heartbreaking to leave. The first and last stops during our trip home to Nova Scotia was Lawrencetown Beach. Even if only for a few minutes, that walk in the salt water and the sound of the waves crashing, can centre me. I finally feel like I’m home. And it was so very hard to leave again. Why did I leave my shoes in the car? Why oh why did I leave my shoes in the car? Walking barefoot on the stones at Lawrencetown Beach, Nova Scotia after playing in surf with Randy Matheson. August, 2011. Randy snapped this photo of me trying to keep my balance and navigate the 50-60 feet of stones between the sand and the parking lot. What you can’t hear is me complaining! Even though the stones are smooth, they’re still awkward to walk on in bare feet. The muscles in my feet (and who thinks about muscles in feet?) were aching for days afterward! Lost Opportunity – Is it Ok to Walk Away from Opportunities? Someone close to me has become frustrated by what he sees as one lost opportunity after another. He feels that every time an opportunity comes my way I walk away for no reason. It’s true that I’ve had a lot of opportunities present themselves to me over the last couple of years and I’ve often turned my back on them. Many times the so called opportunities look like time wasters to me. Often they involve something that just isn’t what I want to do. A gut instinct just tells me to walk away. A couple of times I’ve ignored my gut and taken the opportunity only to regret it later. I’m trying to learn to follow my gut and not just give in to what others see as opportunity. And I think that’s the issue – what might be an opportunity that some would love to have just feels off to me. I feel sick my stomach.Â Paralyzed. 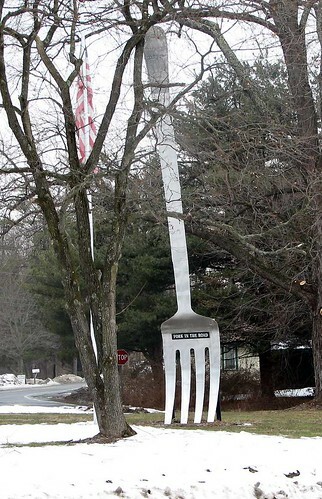 Sometimes when there is a fork in the road, instead of taking what seems to be the obvious path, I chose the other. It’s almost like an invisible barrier prevents me from taking the obvious path. Is that gut instinct? fate pushing me? or is it fear of failure? or of success? What do you think? Is it ok to walk away from opportunity?